Here is my home HF antenna. It is an off centre fed dipole, with 10 feet of vertical radiator. It needs no tuner on 40m, 20m and 10m. 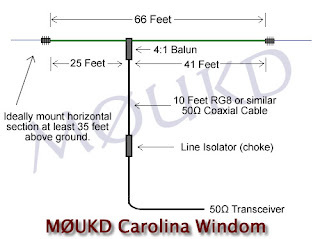 It also works fine on all bands above 40m with a tuner, and even below 40m on 60m, and 80m, although the coax losses will be higher. I have even used it on 160m, but it is very inefficient there. Ideally, this antenna should be at least 35 feet above ground, but mine is currently about 25 feet, and still performs OK. 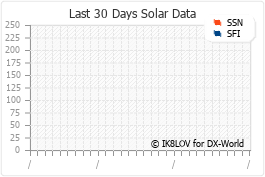 The radiation pattern is improved if it is above 35 feet. The 10 feet vertical radiator really does radiate, and offers vertical radiation to the existing horizontal radiation, and therefore adds to the low angle omnidirectonal radiation. The line isolator stops the vertical radiator radiating all the way back to the shack. This is the same design as the 'Carolina Windom 80 Special' You can buy one of these for £109.95 but this cost nothing like that! 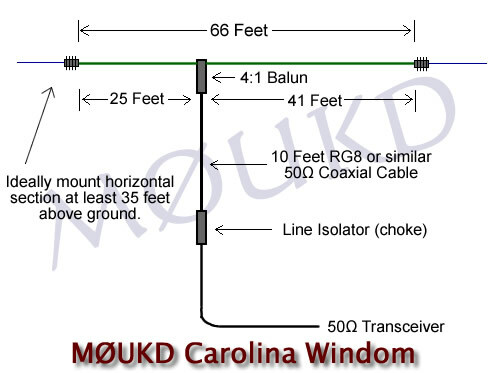 Here is the 4:1 balun. It is 17 bifilar turns on a half inch ferrite rod. 50Ω - 200Ω, 1-30MHz. The line isolator. 10 turns RG8 on a half inch ferrite rod. Line isolator. Made from PVC pipe with screw on end caps. The antenna just fits in the garden, from roof peak to a pole at bottom of the garden. Birds keep their feet warm in the winter months!